Earlier this year, I travelled the French Way with Jerry to collect footage for our series of Camino de Santiago videos. Marisol is a lovely lady who runs a traditional shoe shop in the Main Street in Sarria, very close to the Town Hall. The shop stocks all sorts of quality shoes (sandals, walking boots, smart shoes for both ladies and men) and has been opened for many generations. Marisol and her shop have seen many pilgrims walk past, coming from all around the world. She explained to us that walking shoes were of course one of the most in demand among pilgrims but also other, more fashionable items in good Spanish leather. If you happen to be in Sarria and in need of a new pair of ‘brogues’, pop in to see Marisol. She promised to give CaminoWays.com customers and friends a discount! Luís junior runs a traditional local butcher shop called locally Carnicería Tarazona (although there is no sign of the name). The shop has been opened for over a hundred years and passed from one Luís to the next. Apart from meat (it is a butcher shop after all), the store also sells the traditional Arzúa cheese and other local dairy products. 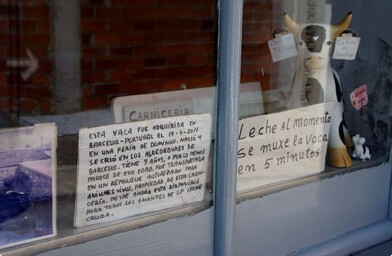 What attracted me to the shop was a sign on the window offering fresh milk, straight from the cow, in just 5 minutes! That’s a fast energy drink, Arzúa-style!